Chesterfield are out of the drop zone for the first time since Boxing Day. A 1-0 win at home to Halifax may not seem much, but it was a huge result and the most important thing is that with Scott Boden returning to Chesterfield we do actually look like scoring. His movement off the ball is something we’ve not seen from any of our strikers all season/ And in this division he looks like a complete player with a scoring record of 12 goals in 30 matches for Gateshead and now Chesterfield. Of the other players making their debuts, Josef Yarney looked comfortable in a back three and Ellis Chapman certainly had a good first half and proved that he can take on the full back and put in a cross, which is something we have been badly missing all season. John Sheridan mentioned in his post-match interview that he’d shouted at Lee Shaw just to take one touch on the ball and get the ball into the box. Having taken this on board, Chesterfield immediately got their penalty from the next cross that came into the area. John Sheridan has proven himself in management, getting players to do the simple things well and cut out the mistakes. He also commented in his interview that he doesn’t need players to run 10 or 20 miles per match if they can’t keep hold of the ball. We didn’t look like losing to Halifax but at times we were watching two sides kicking the ball at each other rather than playing to any recognised plan. Also of note is the fact that Marc Antoine Fortune seems to be instructed to turn with the ball and try to get a shot off, which nearly paid dividends at the end of the first half with the ball going agonisingly wide. For many, a former high-profile player like Fortune ought to offer more to the side than simply playing with his back to goal and trying to feed the ball to others. 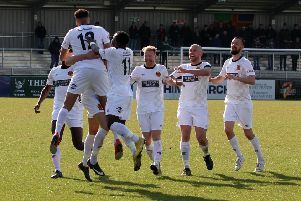 Round the division, Ebbsfleet got involved in more trouble, with four players being sent off in their match against Solihull Moors, two from each side. Next week we go to a motorway junction between Preston And Blackpool to play AFC Fylde, a side who we beat quite convincingly in the FA Cup 3-1 earlier in the season. The key to that victory was that Tom Denton played in the middle with Kiwomya and Shaw running either side of him, giving the home defence a torrid time. Here’s hoping for a similar result next Saturday.